Welcome to a chosen group of works by BC artist Kristi Bridgeman. Kristi prefers warm sepia tones in many mediums and subjects, including acrylic landscapes, illustrations and mandalas. 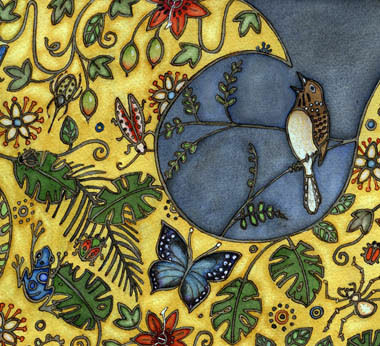 Her work is recognized by whimsical characters, an appreciation of pattern, and a warm ethereal west coast flavour. Pieces can be found in local galleries, children's books, and visits to her home studio. Other books recently released books: "A Carnival of Cats" and "A Parade of Puppies" by Charles Ghigna, "One true Jackson" and "Lex and the Dinosaur Dance" by Rachel Wyatt,"The Rainbow Rocket" by Fiona Tin Wei Lam, "The Sky Tree" and "There Once Was A Camel" by P.K Page, "The Sock Fairy" and "The Knot Fairy" by Bobbie Hinman and "You, Me and My O.T." written by Paulette Bourgeois. Most of these books are available at local bookstores on request or through the artist. 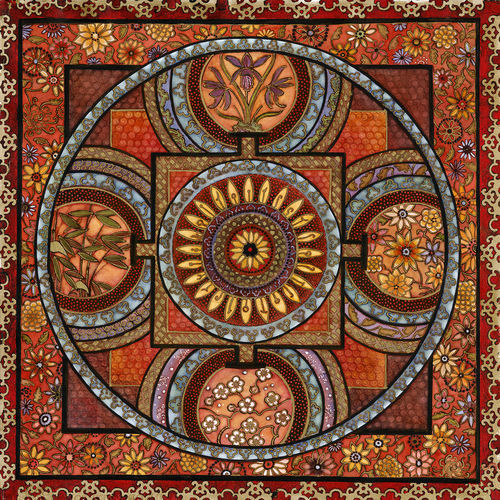 Image "Chrysanthemum for courage" Mandala. Kristi has won awards for her fine art and illustration and has been honoured as one of 150 significant BC women artists, past and present by the Community Arts Council of Greater Victoria. She has been involved with many groups, charities and societies including the Island Illustrators Society, the Federation of Canadian Artists. Other memberships: Metis Nation BC, Friends of Mount Douglas Park Society, AGGV, CACGV, CARFAC, CARCC, ACCESS, SCBWI-BC, CANSCAIP. Kristis fine art work can be found at the Art Gallery of Greater Victoria, Instinct gifts, Munros Books or Jasper Region Museum Gift Shop. 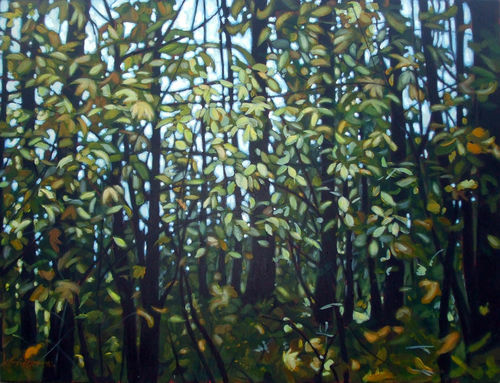 "I find the best way to interpret the west coast landscape is with warm glazes and sepia tones..."
Here; "Big Leaf Maple Indian plum" shows a small section of the local forest understory, from the artists Temple series. 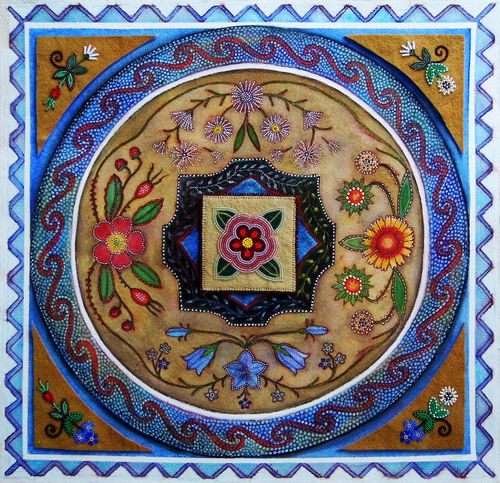 "Forget-me-not, Metis Rose" By Kristi Bridgeman and Lisa Shepherd. Ã¢â�¬Å�MÃ�Â©tis RoseÃ¢â�¬Â� is inspired by the reverse side of the pouch beaded by Suzette (Chalifoux) Swift for her Granddaughter, Eunice( My Grandmother) The five-petal rose has come to represent MÃ�Â©tis women. Endemic flowers: clockwise: Brown eyed susan, harebell, alpine forget-me-nots, prairie rose, wild strawberry, white aster and in the center, the beaded MÃ�Â©tis rose. Medium: Mixed media: sepia ink, watercolour, pastel sgrafitto, wax resist, Moose hide, glass beads. Archival and non-glare glass. The sepia ink and watercolour medium allows for minute details. Some of the pieces are so intricate and embellished that they take upwards of 30 hours of working and reworking. Although my neck and hand get sore, and I need glasses now, the task is not as hard as it sounds. Like crochet or puzzles, the very nature of the work is healthy and relaxing. This was one of the artists original childrens illustration pieces, created with sepia ink. The warm ethereal effect was discovered while searching for a green friendly medium. The antique effect is reminiscent of Arthur Rackham and Victorian Childrens illustrators. 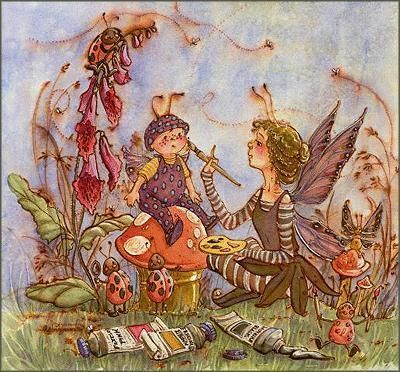 The very idea of fairies required an antique ethereal look.